Martin Torgoff’s Bop Apocalypse (not to be confused with the similarly titled The Bop Apocalypse, by John Lardas) attempts to bring together the stories of drugs, jazz, racial identity, and Beat literature. It is a bold and fascinating book, which mostly succeeds in its aim. The book begins with an idyllic portrait of the first encounters Terry Southern and Bernie Brightman had with marijuana, the drug which will dominate the first half of this book. This is juxtaposed with the hateful rise of Harry J Anslinger and the Federal Bureau of Narcotics. The book then proceeds by switching back and forth between major jazz icons such as Mezz Mezzrow, Louis Armstrong, Billie Holliday, Lester Young, Miles Davis, John Coltrane, and Charlie Parker, and the nefarious and often racist doings of the FBN. For each major figure in the book, we are taken to their first experience with pot, which is invariably presented as rather innocent, then contrasted with the propaganda spewed by Anslinger and others by the time these people are gaining fame. The message is clear – marijuana is a wonderful, innocent thing that helps produce beautiful art, and all the actions taken to outlaw it were mired in racist hysteria. No single piece of legislation more effectively guaranteed the growth of an underground alternative culture in this country than the Marihuana Tax Act of 1937, and no single piece of legislation more decisively declared war on that culture. Soon we are introduced to the Beat Generation, initially through the claim that Jack Kerouac first got high with Lester Young, citing a comment by Edie Parker: “Lester Young turned Jack on to marijuana… I believe it was the first time Jack was ever really high on it.” From there we return to jazz, but later come back to the Beats appropriately through Herbert Huncke, before exploring Allen Ginsberg and William S. Burroughs’ interests in jazz and drugs, and later, John Clellon Holmes, Michael McClure, and Neal Cassady. Torgoff is far better at writing about jazz than the Beats, and these sections of the book – he will continue to move back and forth between music and literature – are a bit choppy and lack the compelling narrative of the jazz sections. He skips suddenly from story to story, and many quotations are unclear in their attribution. Moreover, whereas in discussing jazz history, Torgoff often acknowledges the difficulty in establishing truth, particularly in relation to material from autobiographies like Billie Holliday’s, when discussing the Beats he seems to take every story as truth. Myths, rumors, hearsay, and fiction are largely presented as fact, whereas the parts focusing on jazz are far more selective. It is not just marijuana which Torgoff looks at, although for the first half of the book it seems as though this is the only drug he is interested in. Later he looks at others, like heroin and Benzedrine, in relation to both jazz and the Beats. His section on Ginsberg is for me the highlight of the Beat parts of the book, and this is probably because of the wealth of available material regarding Allen and drug use. Ginsberg was, of course, outspoken on the matter. Yet throughout, Torgoff seems over-eager to state the importance of pot in the creation of jazz and literature. I don’t mean to suggest that pot wasn’t an important component of Beat literature, but he constantly seems to suggest that without marijuana, nothing of any importance would have happened artistically in the twentieth century. Then again, he is able to quite impressively back up these claims with a plethora of references to the influence of marijuana on the Beats, such as Kerouac saying, “I need Miss Green to write; can’t whip up interest in anything otherwise,” or Ginsberg explaining “a process of cultural and personal deconditioning” brought upon by smoking weed that essentially coalesced the Beat group and resulted in their art. Indeed, this is often a well-researched book with some great passages on drugs in Beat history which will prove worthwhile for any Beat aficionado. When Torgoff states that “’Howl’ could no more have been written without jazz than it could have been written without mind-altering substances, especially marijuana,” it is a comparatively rare association between jazz and Beat literature in the text. While the book may focus on jazz and the Beat Generation, it often seems that these are two parallel threads – two more or less separate stories running through American history, being shoe-horned together into a book because these were two groups that both created art and relied heavily on a variety of illegal substances. There aren’t as many explicit connections as one might expect explaining any real relationship between the movements. The Kerouac sections mention him smoking pot with Lester Young, but offer surprisingly little on the influence of jazz on Kerouac’s work except for quoting extensively from his wonderful descriptive passages in On the Road, while the influence of jazz on “Howl” is dealt with very briefly. Burroughs, to the best of my knowledge, was never particularly interested in jazz, and only seems to be included in the book because he, like Charlie Parker and John Coltrane, had a long addiction to heroin. 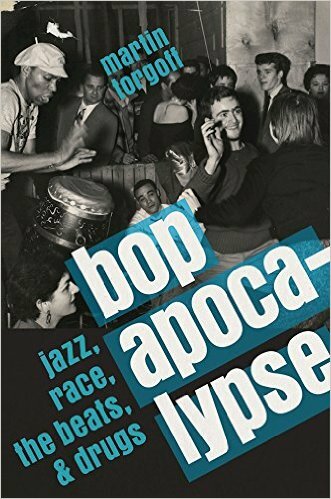 Bop Apocalypse: Jazz, Race, the Beats, and Drugs is an entertaining read, exploring some of the most interesting lives of the twentieth century, with a particular focus on their use of illegal substances. It will prove enjoyable for anyone interested in jazz or the Beats. The book will be released on 10th January, 2017, by Da Capo Press.